It’s that time of year when family photos start arriving on holiday cards from relatives across the country. Why don’t you do something different this year and create a new kind of family portrait? Make an image that illustrates the traits and ancestry you share with your family that are revealed in your DNA. We’re hosting a “new kind of family portrait” photo contest where the prize is four 23andMe kits for you and your family! 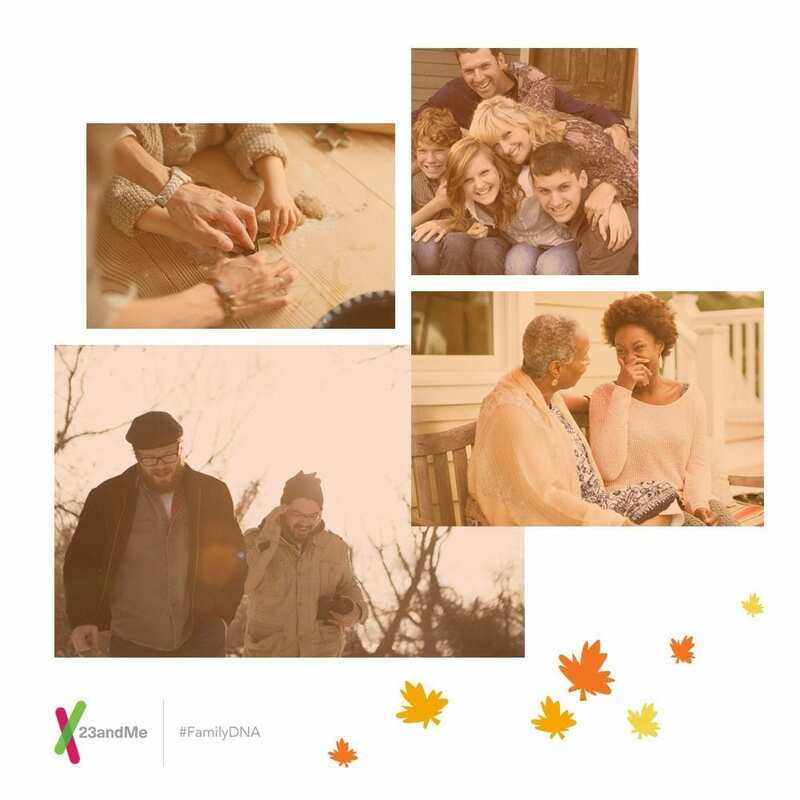 Entering is simple: create a family portrait this Thanksgiving, tag it #FamilyDNA, and share it with 23andMe on Facebook, Twitter or Instagram and get a chance to win. Be sure to tell us why you want to win! Not sure what kind of photo to share? Take a pic that shows whether you look more like mom or dad. Try to fit the most generations in your photo. Show us where you got that curly hair — from grandma? Bonus points for creativity! We look forward to seeing your families and to helping you create a new kind of family portrait with DNA! 1. Must be a legal US resident age 18 or older; residents of Maryland are not eligible to participate. 2. One winner will be selected by a panel of 23andMe employees, from Facebook, Twitter or Instagram photos tagged #FamilyDNA between November 20th and December 1st. 3. On Facebook, share your image on our Facebook wall to be eligible: facebook.com/23andMe. 4. On Instagram and Twitter: follow @23andMe to be eligible. 5. Your image needs to be publicly viewable in order to win. 6. We will contact winners via Facebook, Twitter or Instagram, so be sure you’re following, and look for a message from us by December 10th. 7. A full list of rules can be found here.